All you need to know for guaranteed success every time! Growing from seed is the lowest cost and most rewarding method of raising your own plants. Whether you are sowing into seed trays and propagators, or directly into the ground, there is nothing more satisfying than a glorious display of colour and scent, or a bumper crop of tasty fruit and vegetables, that you have grown yourself. Directly into the ground where they are intended to grow – the quick, easy and very low cost way to fill your garden with vibrant flowers and tasty vegetables. You might be surprised to know but you really don’t need a big garden to start growing your own vegetables any space will do as long as it’s a sunny open spot. If you have a garden or allotment, be it big or small, you can make a dedicated vegetable patch. Alternatively, you can grow within a mixed bed with flowers, in pots on the patio, in outdoor window boxes and even your kitchen windowsill will provide you with a lovely crop of herbs, tomatoes and peppers. If you are short of space then use large pots and containers. Tomatoes can be grown in hanging baskets, runner beans grown up ‘wigwams’ of bamboo canes and even pumpkins and aubergines can now be grown in pots! Raised beds also provide an attractive and practical alternative to growing in the garden soil due to the fact you can select the positioning, Eg. A sunny spot on the patio. These will also help provide earlier and longer cropping of your veg. Most vegetable seed can be sown directly where you want them to crop. However keep a watchful eye on the weather and wait until the soil has warmed up to at least 6°C. 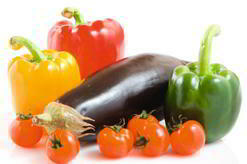 There are a wide range of vegetables that are quick and easy to grow. Whether you have pots on the patio, a window box or a dedicated vegetable plot. Easiest and most rewarding vegetable varieties to get you started. There are four easy ways to start growing your own; Packeted Seed, Seed Mats, Seed Tapes or Seed Kits! Packeted Seed – Fill a seed tray (or other container) with a good quality compost such as Suttons All Purpose Compost leaving a gap of about 1cm at the top of the container.Scatter seed evenly, pressing it gently into the surface. Cover larger seeds with a light covering of compost. Then gently water your seeds and keep them in a warm, draught-free spot indoors (see back of packets for more information).Items such as salad leaves, beetroot, carrots, parsnips etc. can be sown directly where they are to grow. Seed Mats – A very easy way to starting your seeds growing indoors. Fill a container with good quality compost such as Suttons All Purpose Compost leaving a gap of about 2cm at the top.Simply lay your seed mat on the compost and cover lightly with compost. Gently water your seed mats and keep them in a warm, draught-free spot indoor (see back of packet for full instructions) No thinning out of the seedlings as they grow is required as the seed is pre-sown for you, which leads to healthier, stronger plants as there is no disturbance to the roots.
. With a stick or tool handle, make a ‘drill’ or groove in your garden soil, and then simply lay your tape along the groove and cover with soil. Water the ground well. No thinning out of the seedlings as they grow is required as the seed is pre-sown into the tape which leads to healthier, stronger plants as there is no disturbance to the roots. See back of packets for full information. Suttons Jiffy 7® Seed Kits – Add warm water to the tray to expand the Jiffy® pellets, pouring off any excess once they are fully expanded. Plant 2-3 seeds in the centre of each Jiff®y pellet. Remove excess seedlings so you are left with just one per Jiffy® pellet. Grow your seedlings until they are ready to plant out. See seed kit packaging for full information on this very easy and quick way to produce your own vegetables. Some seeds may need to be started indoors or undercover (excluding seed tapes) please check individual packets for full sowing details. When the seedlings are large enough to handle, transfer to larger pots (8cm (3″) is usually the best size to use for this job) or into trays of compost to allow them to grow and develop more easily. 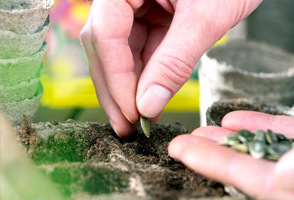 Do this by gently holding the top leaves and carefully ease out the seedlings from their original growing container (if using a seed kit remove the pellet and seedling together). Use a pencil (or even a teaspoon handle) to create a hole in the ‘growing on’ pots or containers. Place your baby plants into prepared holes taking care not to damage the roots. Gently firm the compost around the roots and stem to leave the first leaves just above the surface. Water gently keep them in a warm spot indoors and protect from direct sunlight for the first 3-4 days. Prepare your seed bed in a sunny, open spot (March – May for most vegetables). Dig over and leave until the first weeds appear. Pick out these weeds and rake soil to a fine crumbly surface. Tip! – Digging a good quality general garden fertiliser or compost into the weed free soil, before sowing the seeds, will give you a better crop of tasty vegetables. Broadcast Method: Scatter your seed on the surface of the soil in a circular motion, to cover the space available. These can be raked into the surface or covered lightly with compost and pressed down gently. Sow in rows: This method is useful with fine seeds such as Carrots. Sow thinly in a pre-marked ‘drill’ (shallow groove). The seedlings may need to be thinned later to allow enough space for your veg to grow. Larger seed such as Beetroot is easier to handle and can be planted singly along a ‘drill’- this reduces the need for thinning out later on. Seed Tapes: The easiest way to grow your seeds. In a pre-marked ‘drill’ simply lay your tape along the groove and cover with compost. No thinning is required which leads to healthier, stronger plants as there is no disturbance to the roots. Whichever method of seed sowing you choose, water the seed beds with a watering can that has a fine rose. This will prevent a wash effect that would disturb the seeds. When the seedlings are large enough to handle, thin out (not required if using seed tapes or mats) to the distance shown on the pack. Use any surplus seedlings to fill the gaps that might appear leaving well spaced plants (see back of packets for information on the correct spacing of seedlings). Always water transplanted seedlings. Remember to keep plants watered and fed as required. You can achieve a glorious selection of vegetables on your patio using a variety of containers. Anything from stone urns and wheelbarrows to old boots and tin cans can hold plants; so long as they have good drainage (placing small stones or broken pots in the bottom of your container will help here). Then fill with good quality compost and plant up as required, once all danger of frost has passed. Don’t forget to water containers regularly especially during hot weather. Apply a good quality liquid fertiliser weekly or add a slow release fertiliser to the compost along with water retaining gel granules to help reduce the need for more frequent watering. If you are lucky enough to benefit from a garden or allotment and would like to get the most from it we recommend that you move each section or family of vegetables within your plot each year – this is called “crop rotation”. This will help reduce pests and diseases, maintain soil fertility and nutrients, and reduce the need for fertilisers. When planning your plot you will firstly need to decide on the vegetables you want to grow (and eat), giving consideration to the amount of space you have available. If possible you should aim to produce vegetables all-year-round without shortages or excess. The area chosen should be divided into three equal sections. Section 1 – If you can, dig in well-rotted manure or garden compost in the autumn or early winter – it’s not essential but it will give you better crops; in the first year grow Beans, Leek, Lettuce, Onions, Peas, and Tomatoes. Section 2 – A general garden fertiliser should be applied 10 to 14 days prior to planting or sowing. This area can then be used for growing Broccoli, Brussels Sprouts, Cabbages, Cauliflower and Kale. Section 3 – Apply general fertiliser prior to sowing and planting. The crops to be grown in this section include Beetroot, Carrots, Parsnips, Potatoes, and Swedes. Year 2 As above moving all crops on one section. Year 3 Crops and treatments are rotated once more so that all sections have grown all plants over a three year period. Beans can be soaked overnight and placed on damp cotton wool or blotting paper to shoot. This will speed up the germination time. Seed trays are low cost and re-usable however you can start your seeds in something as simple as a margarine container – just remember to add holes for drainage. You can always use spare seedlings of lettuce or onion, for example, in salads. Seed swap with friends and family. If you each grow a different variety you can exchange the seedlings. Lollipop sticks make cheap and sturdy seed labels. Store spare seeds in a sealed container with a few grains of rice to keep them dry. Make fortnightly sowings of salad leaves to maintain fresh supplies throughout the summer. Keep picking Runner Beans, French Beans and Courgettes. This will encourage them to keep cropping, and ensures that the veg is picked when it is sweet and tender. Grow a selection of lettuce varieties to give your garden or container an interesting range of colour and leaf shape – this also provides a mix of taste and texture for your salads. Don’t forget to use the lettuce seedling thinnings in salads. Do not allow containers to dry out. Many vegetables bolt (run to seed) or split if the water supply is erratic. For early beans start the container indoors and move outside once the danger of frost has passed. Protect your pots from slug attack with copper tape around the pot – they don’t tend to cross it! Plant some marigolds in with your tomato plants to discourage whitefly. Keep some polythene or fleece handy to cover young plants in bad weather. Always protect them from frost should the temperature fall significantly. Tip! – click the + and – icons below to reveal the answers. Is there a wrong way to plant a seed? All seeds are different. It is best to go by the individual packet instructions. How deep do I need to sow the seed? This depends on the seed. Some need to be sown on the surface as they need light to germinate. Others need darkness. As a ‘rule of thumb’ cover the seeds with a depth of compost the same height as the seed, but again, it’s best to go by the packet instruction. How strict do I need to be when following the sowing times? Sowing times on packets are a guide only, but sow too early and your seeds may not germinate and too late your plants may not have a long enough growing season to produce those tasty vegetables. Is there a difference between seed quality? Very much so – always get your seed from a reputable seed company as they should have run quality tests on the seed to ensure good germination and trialled the variety to make sure it produces the plant shown on the packet. Are there any varieties you cannot plant together? No, but some plants are better to grow together than others – these are sometimes called ‘companion plants’ and can be used to deter pests. Eg. Onions grown with cabbages helps to deter the cabbage fly. The pack says to start the seed in small pots; what happens if I sow the seeds directly into the soil outside? Unfortunately there is no straight forward answer to this. With some varieties you could sow outside. It may be that the pack says start in small pots to give the plant an early start Ie. the plant needs a long growing period – so sowing directly outside may mean a later crop or flower. How often should I water/fertilise my plants? This varies with the type of plant. For water, it is best to keep your plants moist. Feeding – for pot grown plants after ‘pricking out’, normally, a good quality compost should contain enough feed for 4-6 weeks. For outside sowing – normally a light dressing of fertiliser should see the crop through to fruition. My plants have gone a bit yellow and droopy; what should I do? Normally this would indicate that your plant’s compost is either too dry or too wet. Monitor and adjust your watering accordingly. I live in the north of the UK – what can I grow? With the advent of polythene tunnels people can now grow most vegetables successfully. However problems occur with varieties that need a long growing season Ie. The far north usually has a later spring and earlier autumn frosts. As long as your plants are protected from the cold they should be fine. How do I stop caterpillars/slugs eating my vegetables? Chemical controls are available – look in your local garden products retailer. Physical controls – Eg. using special garden fleece to keep of the moths/butterflies from laying their eggs on the crops, or going round at night with a torch and picking off slugs and snails by hand! Biological controls – available for both problems. Bolting – this is where the plant grows too fast due to being either being too wet or too dry, resulting in the stem shooting up and the plant ‘going to seed’. To avoid this simply grow a ‘bolt resistant’ variety eg. Beetroot Boltardy. Chitting – encouraging your potatoes to sprout shoots before you plant them to give them the best start. Leave them in an open box on a light windowsill until the shoots are approx 2cm long. Pinching out – to encourage the growth of bushy side shoots you will need to pinch out the growing tip of the plant. This can be done with veg, flowers and herbs. NB. This process is not required for trailing or hanging basket tomatoes. Cultivar – a plant that has been specifically selected and bred for its characteristics and is not usually cross-pollinated. Crop rotation – the process of moving families of crops around your vegetable plot each year in order to avoid pests and diseases and to maintain good fertile soil. Grafting – the union of two growing stems from two different plants; usually a strong root stock with a tasty fruiting variety or an abundant flowering variety. This produces a super-strong plant that is disease resistant and provides a much bigger crop over a longer period. Going to seed – where a plant stops producing flowers and starts producing seeds. Hardy – a plant that has a high tolerance to the weather extremes (frost, drought) and can be planted directly outside. Half-hardy – a plant that needs to start growing indoors and can then planted out when the danger of frost is past. Annual – a plant that lives and flowers for one year only. These are ideal for sowing direct into the garden where you want them to flower. Perennial – a plant that lives for more than two years. Will generally be hardy so that it can survive the winter. Biennial – a plant that takes two years to reach fruiting or flowering. Hardening off – the process of acclimatising plants before planting them outside in the garden. Potting up/on – transferring your seedlings into larger pots so they have more room to continue growing. Hybrid – the cross-breeding of two plants chosen for their particular qualities (Eg. disease resistance, tasty fruit, greater yields), resulting in a new variety that has all the good traits of the parent plants. Jiffy 7 peat pellets – expandable peat pellets used for giving seeds the best start. No mess, just add water! Pricking out – once your seedlings have germinated they need a bit more room to grow so need to be transplanted into a larger seed tray or individual containers to encourage growth. Thinning out – the removal of overcrowded seedlings – usually from outside sowings. These surplus seedlings are usually discarded or in the case of salad crops such as lettuce, can be eaten!. Succession cropping – the process of sowing seed every few weeks to ensure regular cropping throughout a season Eg. Sow lettuce seed every two weeks for salad leaves throughout the summer. Tilth – the physical characteristics of the soil, Ie. a good tilth – a finely raked, crumbly structure with the right moisture content. Germination – the sprouting of a dormant seed following the provision of water, warmth and light. Drill – a shallow groove in the soil prepared for sowing seeds. Widger / Dibber – two tools that can be used to aid ‘pricking out’ and ‘potting on’. The Widger removes the seedling and the Dibber makes a hole in the compost for it to be placed into. Happy Gardening from Suttons Seed! on my upstairs outdoor patio!